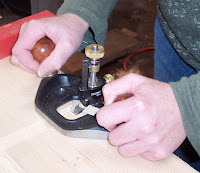 While cutting dadoes for my current project, I chose to use my Lee Valley router plane—an impressively engineered and well-designed tool that is a joy to use. Before plunging in with this tool, you have to first define the outside edges of the dado. I used an exacto knife, but you can also use a handsaw. 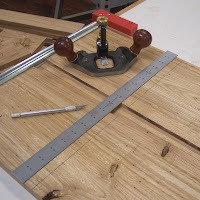 To use an exacto blade, make several passes along the edge of a ruler and start with light cuts with the plane until you have defined the shoulders, otherwise the blade might tear out some wood running with the grain. As the plane reaches the depth of cut established by the exacto, deepen the shoulder cuts again with the exacto before proceeding with the plane. Continue to alternate these steps until you reach your final depth. If you don't have a router plane, you can also remove the waste with a chisel and check the depth as you go to ensure a flat channel. I would chisel bevel down in this case to best control the amount of wood removal. In the last photo, the rabbets were made with a table saw (the ones with burn marks) and the dadoes were made with the router plane. Two boards are laying side by side, so the rabbets look like a wide dado in the photo. *Dadoes are channels cut into wood that run across the grain. Grooves are channels cut into wood that run with the grain. 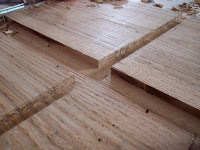 And rabbets are channels cut into wood that run along the outside edge of a board. **There are more handtools you can use to cut dadoes, grooves, and rabbets that are not listed here. That's another post!